The Lawrence and Isabel Barnett Center for Integrated Arts and Enterprise educates and prepares students for successful careers in the arts and related entrepreneurial fields. The center advances and increases students’ understandings of the business side of the arts and the worlds of arts management, policy and culture. Lawrence Barnett, a native of Orrville, Ohio, and alumnus of Ohio State, worked with Columbia Broadcasting System Artist Bureau, representing such notables as Guy Lombardo, Sammy Kaye, Ronald Reagan, George Burns, Dean Martin, Jerry Lewis and Jack Benny. Barnett later became president of Music Corporation of America (MCA), chairman and president of General Artists Corporation (GAC), executive vice president of Chris-Craft Industries and vice chairman and director of United Television, Inc.
Isabel Bigley Barnett starred in Rodgers and Hammerstein’s Oklahoma! and Me and Juliet, and is perhaps best remembered for originating the part of Sarah Brown in Frank Loesser’s Guys and Dolls, for which she won the Tony in 1951. Isabel donated her extensive collection of theater memorabilia to Ohio State’s Lawrence and Lee Theatre Research Institute in 1993. 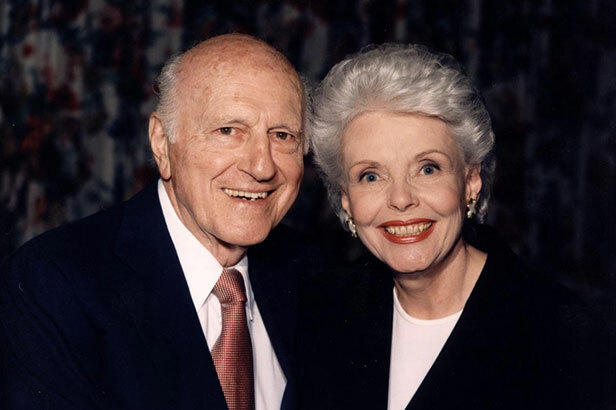 The Lawrence and Isabel Barnett Center opened in January 2014; it was established in 2012 by a generous donation from Ohio State alumnus and entertainment industry leader, the late Lawrence Barnett and his wife, Isabel. The Barnett Center expands the vision of Lawrence and Isabel Barnett who imagined creating a place where students could learn skills and abilities that would equip them to be successful in the arts. Speakers and seminars that offer a platform for new thinking, research and practice in integrated arts, arts entrepreneurship and enterprise by faculty, students, artists and entrepreneurs in all areas of the arts. An in-depth inquiry and analysis of public and not-for-profit sector policies and practices. The inaugural symposium in 1993 brought together key figures from foundations, state arts councils, university experts in public policy, artists and arts administrators to discuss the broad topic of public policy and the arts. The symposium is a biannual event. Supports students interested in graduate level studies in arts policy and administration. It covers tuition and fees, and offers a monthly stipend and annual travel grant. The fellowship lasts for two years and has supported nearly 50 students in the Department of Arts Administration, Education and Policy. Christine Ballangee Morris was founding director of The Multicultural Center at Ohio State, former coordinator of American Indian Studies, and Professor in the Department of Arts Administration, Education and Policy. Morris’ research interests include self-determination, identity development, Indigenous arts, integrated curricula, service-learning, visual culture and arts-based research. Prior to coming to Ohio State, Morris worked as a curricula developer for a children’s art museum in Charleston, West Virginia, and taught in public schools for over a decade. In addition to her scholarship and teaching, Morris is a performing artist, who has held numerous artists-in-residence positions in several states with her late husband, David E. Morris. The Barnett Ambassadors is an advisory committee made up of representatives from: Ohio State departments, colleges, schools and centers including the Fisher College of Business, School of Music, Wexner Center for the Arts, Department of Art, The John Glenn School of Public Affairs and others; City of Columbus representatives includes the Greater Columbus Arts Council and Columbus Public Health; non-profit and business representatives includes VSA Ohio, Black Arts Plus and Huntington Bank; Ohio State alumni and emeritus faculty; and Ohio State students both undergraduate and graduate. The Ambassadors meet up to three times per year, attend Barnett Center activities and events when possible, introduce/connect the center director to internal and external constituents and recommend possible collaborations, partnerships, programs and activities..